The Baltimore-Washington International Airport created the BWI Observation Gallery to restore fun to the airport environment. To make sure the gallery has optimal air quality, Horton Mechanical Contractors hired Duct & Vent Cleaning of America, Inc. to assure long-lasting, clean air for the airport gallery. While working beside a multitude of other contractors and plane wings, Duct & Vent Cleaning of America, Inc. provided excellent service and completed the project well within the two-week deadline. Duct & Vent Cleaning of America, Inc. improved the BWI Airport project by providing safe, certifiably-clean ducts. Maintaining clean heating, ventilation and air-conditioning (HVAC) systems is an important part of sustaining acceptable indoor air quality (IAQ). Duct & Vent Cleaning of America, Inc. provided quality air duct system cleaning services to reduce and eliminate contaminant introduction. Duct & Vent Cleaning of America, Inc. has more than 23 years of experience in maintaining air ducts to guarantee clean air for years to come. They recognize the importance of quality air duct system cleaning, and they adhere to the highest industry standards. "Our work is cleaned to NADCA ACR standard 2013, which means the job is being done right. We also have experienced people do the work to assure the highest quality possible," said Jennaro Pullano, the project's Territory Account Manager. 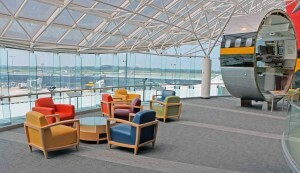 The BWI Observation Gallery is a widely used area of the airport, and thanks to Duct & Vent Cleaning of America, Inc. it also preserves visitors' health. For more information on how Duct & Vent Cleaning of America, Inc. can help with your duct and vent cleaning needs, call us today at 800-442-8368 or visit us online at www.ductandvent.com.